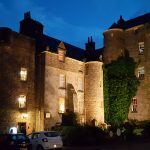 I arrived in St Andrews after an 8-hour flight from Orlando and then a 4-hour train trip from Manchester Airport. Shortly after checking into the Best Western Scores Hotel, I decided to walk down to the starter to scout things out for my next two days in town. If you want to play St Andrews, as a single, the process is simple. Wake up in the early morning hours and head down to the starter to get a place in line. If you get your place in line early enough you will usually end up getting out at some point during the day. 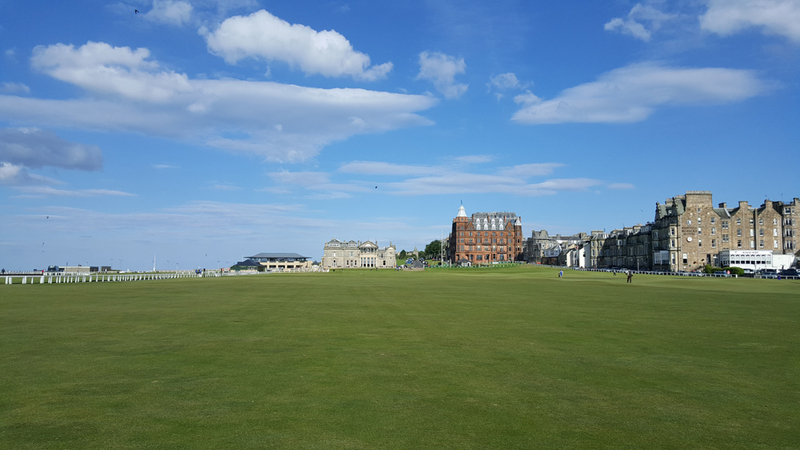 Saturdays at the Old Course are typically the best day because there is no 48 hour advance ballot. This means more potential openings for walk ups. I spent about 15 minutes talking to some of the staff members in the starter area and was told that there might be an opening in the last slot of the day but there was no guarantee to finish in full light. I was told to check back around 3-4 pm and they could give me a better idea if this was a realistic possibility. I was tired from the overnight flight and subsequent 4-hour train trip but this was a no brainer. Plus, this would allow me to avoid having to wake up at 2 am the next two mornings to camp out at the starters shack with hopes of getting out at some point in the day. After having a nice lunch at the Dunvegan Hotel I went back to the hotel, put my golf clothes on, grabbed my clubs and headed back to the starter to see if it was my lucky day. I hovered around for 20 minutes before getting the word that I was going to be able to make it out in a two ball in the last tee-time of the day, 18:00. I was fully aware this meant that I would probably not be able to finish before dark but no way was I going to miss this opportunity. It might never come around again even with two more days in town. The first tee at St Andrews is the most intimidating in all of golf. There are always dozens of people watching from what feels like all sides, tourists, golfers, and even local residents come out to watch golfers tee off on the first hole. It is not as busy in the late afternoon hours as it can typically get mid-morning or right after lunch time but nevertheless there had to be at least a dozen people watching when I took my first swing. Even with the pressure, I somehow managed to nail a 3-wood right down the center of the fairway and we were off and running. There is no better stroll in golf than the one off of the first tee at St Andrews. It is an absolutely surreal experience. Words cannot describe the feeling you get when you walk down the first fairway at the Old Course. The Old Course is not a difficult layout from tee to green unless conditions are bad. 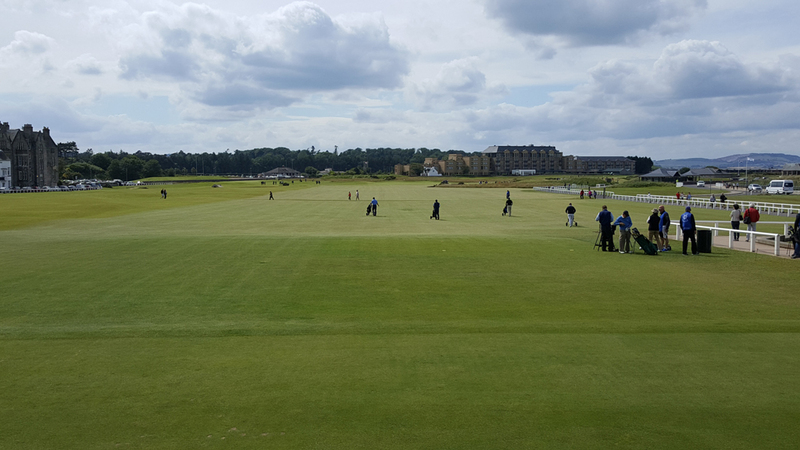 The greens at St Andrews are what set it apart from most other links courses in Scotland. 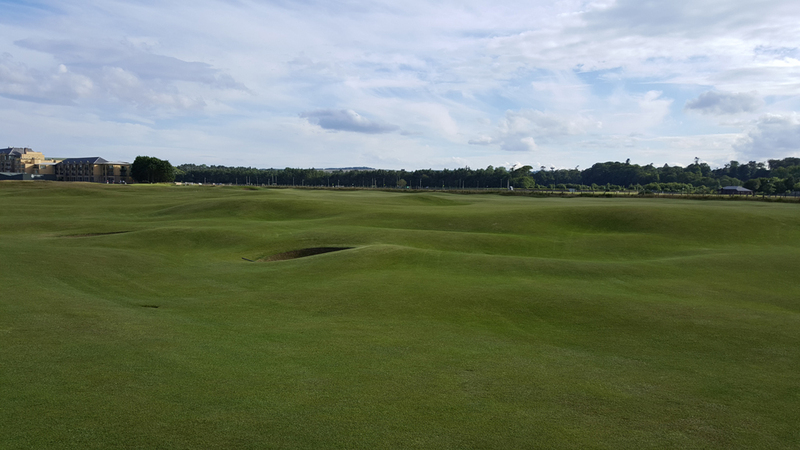 The undulations and the size of the greens at the Old Course require incredible skill and touch around the hole. After the breathtaking first hole, the layout of the Old Course isn’t that exciting until you reach the back nine. 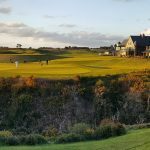 The 7th hole is a fun par, 4, 8-10 are nothing to write home about, and 11-14 provide a fun four-hole table setter to when things really get exciting starting on the 15th hole. 15-18 are when the blood really starts pumping on the Old Course. To me, it is the greatest 4 hole stretch in the game of golf. The 15th green, the precision needed on 16, the famous road hole and then walking down the 18th hole over the Swilken Bridge. I spent most of the back nine playing a little quicker than I would have preferred but we were so concerned with being able to play 17 and 18, in some visibility, that we had no choice but to play fast. 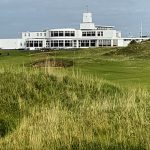 Even though we played at a quicker pace than desired, we still ended up finding ourselves playing the famous final two holes in near dark conditions. 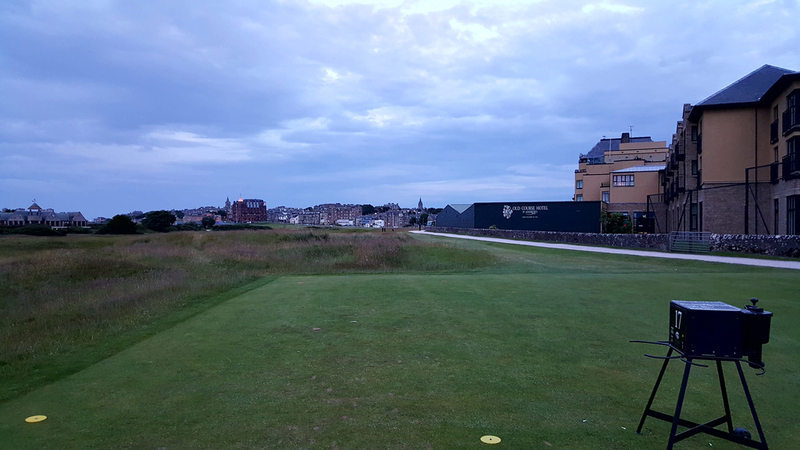 If it wasn’t for the lights coming from the Old Course Hotel on 17 and the brighter lights of the town of St. Andrews on 18, we would never have been able to finish. 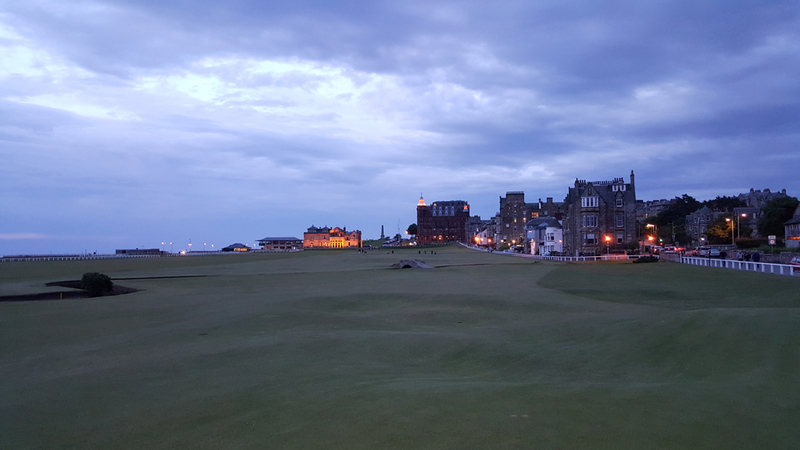 I will still never forget the experience of strolling down 18 at 10:30 pm with only the glow of St. Andrews providing the little bit of light to be able to play. I managed to hit a perfect drive on 18 and then flushed my second shot onto the right side of the green in near pitch black conditions with only the city of St Andrews offering a glimmer of light. I two putted and finished the 18th hole with a par. It capped off what was probably the greatest round of golf I have played in my life. 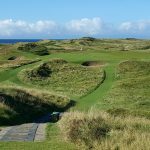 From a design perspective, The Old Course is not the best course in Scotland, in fact it is probably not in the top five, but what set St Andrews apart from every course in the world are the history, setting, and multiple famous holes. I will never forget the memory of walking over the Swilken Bridge and up the 18th hole with my dad. 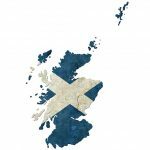 St Andrews has many incredible aspects that stand out and if you are fortunate enough to be able to play the Old Course it will leave a lasting memory that will be with you forever.